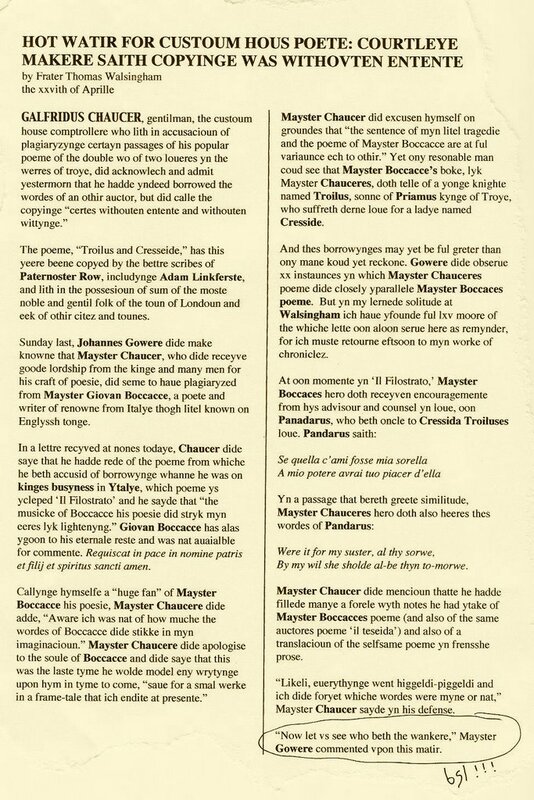 Geoffrey Chaucer Hath a Blog: BXB&B, this ys right awfulle! BXB&B, this ys right awfulle! Do rede of thys by clikkinge vpon yt, and see myn sorwe and nuisance! As yf that wankere Gowere knewe of what ich reallye did to Il Filostrato! Ich dide turne yt from a foule Italienne loue poeme ynto an historiale werke of Englysshe ful of high sentence. Thanke myn luckie sterres that the Lombardes sit nat high yn Kynge Richardes estimacioun, and ther shal likeli be no tryale or settlemente. ich wold pleade "creatifve ynterpretacioun of ye poeme of Boccacce" and presente yon case as a moderne remaeke yn ye tradicioun of ye Woode of Holly. Manye have done suche and beene ycleped genius. Yes, hwat that "concernede admirere" sayde. Alas and welawey, min herte bledeth for you, maistir Chaucer. You could also point out that copyright laws (as such) haven't been invented yet. Gowere ys alle talk. Y hav sene hys pwning. In ymages righte vyvid. Gowere ys a damnéd punke. Be neyther of highe dudgeone, maistir Chaucer, nor sholdst thou let Gowere gett your goate. Thou art an artiste and he shold iust let you gette on with yt! Assuredly, thou shalt have nat neede to be worryede on any score of tryal for plagium. Ye Lombardes have been a sore tryal themselves, and right weel are we pleased to see them discomfited and low italic japes turnede into hye Englisshe sentence. Be minded, though, myn goode maistre Chaucer, nat to aske regardinge anye rise in thyn personal recepts. Ich shall natte too soon enquyr into the doings of myn customes house, yet bee thou mindful of quo warranto. Bi seynt James of Compostelle, gowere his wankerie knoweth no limites. Of course you did original work in your version -- you invented a new verse form! Swete nat lyk as a stillatorie, GC, this eek shall passe. And did nat thilke Gowere stele from thee, in thine tale of the physician for his stoon dumb and pretensed Confessio? You could remind the court of a writer not yet born named Emerson who wrote an essay called "Quotation and Originality" where he said: "We recognize genius by what he quotes as much as he originates." By quoting that other guy, you are asserting your genius. BSJP! Even a poeme borrowynge from the Ytalyan ys bettre than Frater Thomas Walsingham his chroniclez. Yt wolde be vnjuste to short-chaunge thee of swich an opportunitee. Nevir wolde ich chaunge my mynde in swich wise as to prevente a profitable eschaunge of viewes bitwene thee and thyn classe. Thogh thys worlde ys ful chaungeable, neuirtheless, litel matir thes kalendes of chaunge when myn entente to yiven delit and solaas staith stedfaste. Also, basicallye yf ich do putte somethynge online, thou shouldst considere yt 'free game' for classes. Ywis, ich am muche plesed and flatrid that thou woldst consider menciouning myn litel blog in ony akademik settynge. Ich hope thou farest wel. BSJP! ys myne owne abbreviacioun for By Seintes Johannes and Paul! Ich do supose yt coulde bee By Seinte Jeromes Penne! also. O, how gaastlich! A, but take the confort -- atte lest wrote hem thy name with the gender propre. Philippe doth oft tellen me on how she be ever scritten by error in acontene bokes as "Phillipus Chaucer." She sayth hit be because she dwelleth about the court somewhat mower than the. But forwhy they in these samen bokes yclepen the "Geoffrina" I ne wit. "As yf that wankere Gowere knewe of what ich reallye did to Il Filostrato!" Perhaps you could bring to your defence the argument of another great writer, C.S.Lewis, who wrote a little essay on this very matter. In his view, your poem is far "more lively and of deeper human appeal than its original" - anything Boccaccian you touched on in that poem of yours turned to gold. Lewis' essay also turns the tables on Master Gower, revealing HIM to be a plagiarist of the first order. Lewis suggests (with good grounds, I believe) that this petty poetaster was in fact usurping your already-established role as the faithful interpreter of the love tradition in his derivative "Confessio Amantis." Take him to the King's bench, Master Chaucer, and sue him for every penny. I'd be happy to assist you. Maister Geoffrey, thyn tale been vsage transformaciounal, and so no true plagiarie upon Boccacce his Filostrato. thi accusatio and yowr excuses bothe been absurde. but hertilie amusynge. whan that i sende yow the beste-sellir latyn treatise of boccace 'de casibus' forto mak in anglische tonge, i pray yow rime a prologus makynge merri of the whole matter in mannere of a dreme. figure yow that priggish monke thomas in likenesse of cupide, do! For al thy worthynesse, for al thy beautee and thy gentillesse, for al thy song and al thy mynstralcye, for al thy waityng, blered is thyn eye with oon of litel reputacioun, noght worth to thee, as in comparisoun, the montance of a gnat, so moote I thryve. Ye shuld gette a goode Lawyere. The Plea of Fotografick memnorey culd be yused. Lat nat ye wordes of Oure Lorde scape thy mynde: Qui acceperint gladium gladio peribunt, &c.
So be of gode chere, frend Geffrey, for Gowere is ane Liare & eke ane Plagyariste, & for swich ane one schall he be sene ere Michelmasse, that swere ich ful solempnely. Yt semes to me somwhat convenient thatte yow sholde publisshe thys articel in letteres so smale thatte I canne not rede them. And for yow then to make gret stevene that ich have ydonne yow sum unfayreness seemes to me suspiciouse. Ywis it aperes to me thatte thys litel blogge-poste doth showe who be a sober and carefulle wight and who be prone to runninge witles with the crowde. For who can rede swich smale prynting? Thys stille be griste for the mille dere sire. "For who can rede swich smale prynting? " 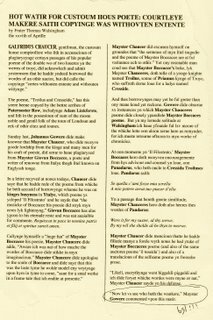 Myn pooste clearlie doth saye to 'klikken' vpon the picture, for to make the article so large that it shall fillen thy screne. Seriousli, thou shouldst getten thee sum nighte-scole lessouns in how to vse a computir! Ich am surprisede thou art nat moore experienced yn the art of vsyng thn mous, for thou hast a mouses valoure. I dide clicken on thatte pictur and yt was nonetheles too smale to rede. It doth not maken ytselfe grosse as you seye yt sholde. I am usynge the 'fyrefoxe' brausere so yow canst not apayren mine computir or mine skilz. Thou arte the oon who doth resembel a mous, but ich am too much a gentilmanne to saye how. ps. whatte be uppe with the astrolab these dayes, sire Q-tip? Yf that werke nat, ich noot of what weye ich kan helpe thee reden of this artikle. Lewis had more than that to say about the whole modern concept of literary property being, well, modern. In reworking old material, you were following old tradition. As someown sayd elswhyr, twas alle Opeyn Source. ther is no coincidence heere!